Is Java Pass by Value or by Reference? So, Is Java Pass by Reference?or by Value? Contrary to the widespread misconception that in Java ?primitives are passed by value, while objects are passed by reference?, Java is a strictly pass by value program. This means that when an argument or parameter is passed in Java, the resulting value will then be copied into a new location. This will be used as a placeholder for the former value while the function is executed. What Is Passing by Value? As explained above, Java analyzes a parameter or argument and this generates a value, which it will copy into a temporary location, which will hold the place of the initial parameter/argument while the function is executed. It is called pass by value because this placeholder will include a value instead of the initial parameter. 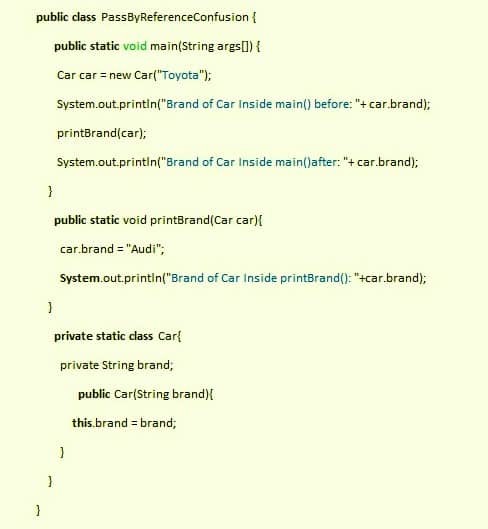 You can get a better idea of the passing by value process in Java by studying the following example we have provided. Screenshot of the Pass by Value example. What Is Pass by Reference? Passing by reference entails that the placeholder for the initial parameter/argument will be in the form of an alias. This alias will appear in place of the actual parameter/argument while the function is carried out. Are There Any Variables Passed by Reference in Java? The answer to this one is a hard no. Java is strictly pass by value. Objects can be passed by reference, meaning that when these objects are assigned to other Java will pass a reference. However, Java will assign a copy of the reference value of the object while the function is executed, which makes it pass by value. To get a better idea of this, please take a look at the example we have provided below. 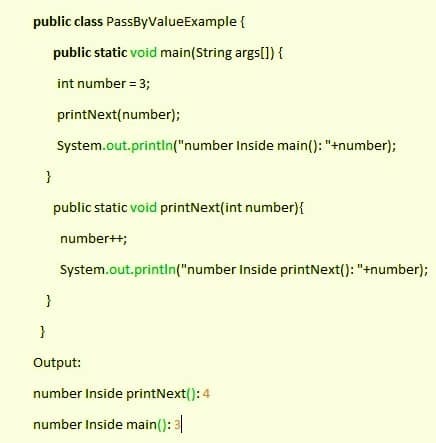 The output of the pass by value example in Java. 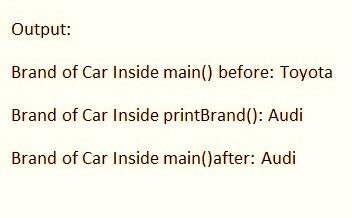 It may appear that Java is pass by reference because it uses the term ?Audi? to replace the initial value of the parameter, which was ?Toyota?. But what you need to understand is that Java passes the value of reference, which makes it pass by value at its core. IT Interview Guide Copyright © 2019.